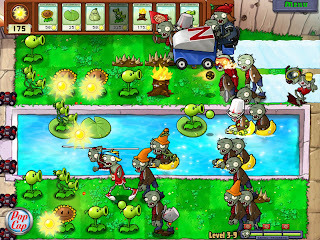 Plants vs. Zombies is a sort of tower defense game, but not like the normal ones you see all over the place. Instead of your enemies having a long and winding path to take to get to whatever objective they seek (in this case, zombies who desire your brains), this game only has five straight paths and nine squares on each path to place your defenses. Your home is on the left and the zombies file in from the right. Also, your defenses are plants. Deadly, adorable plants that shoot peas and require sunshine. Seriously, you have to try it to believe it. I could go on for a few hours about how cute the game is, zombies included. And that's pretty impressive considering the zombies still do undead things like lose limbs when shot and, you know, devour brains. I could go on longer about the amount of personality and humor in the game. The zombies start off as normal mindless nulls and then start showing up with buckets and cones on their heads for protection. Or ride Zamboni machines to create ice for the zombie bobsled team. Or have a jack in the box that explodes. Really, it's weird. But I won't do that. Instead, let's just focus on the important part: how stupidly addictive the game is. When you first start playing, things are easy. This IS a Popcap game, after all, and they like easing the casual crowd into things. Well, the casuals better get used to clicking fast, because very soon into the game things get difficult and fast-paced. A few levels in you're setting up your resources and defenses at a Warcraft II pace and adapting to what the zombies are doing on the fly, trying out different combinations of plants to see what works best. And once you have that figured out, they throw you into your backyard and you have to deal with zombies in a POOL. At NIGHT. IN THE FOG. I couldn't even tell you how long each level takes. All I know is that I lost hours if not days to this game. More importantly, all that time was more fun and involving than any traditional tower defense game I've played. Like Toy Soldiers and Soulcaster, giving you things to do when you're playing "hurry up and wait" does wonders. In this case, you're constantly collecting resources and, on some levels, using explosives (cherry bombs) to take out a few zombies and ease things up on your pea shooters. The constant adapting to your enemies keeps you on your toes, keeps you involved, and most of all keeps you having fun. Once you're done with the main game, you can go through it again with a few of your weapons pre-picked. Or you can go do one of the dozens of mini-games, puzzles, or survival modes the game lets you unlock. Or just plant flowers in your gardens and let them earn you money while you tend them. There's more to do here for your ten bucks than there is in most sixty dollar games, and every one of those hours you spend on the game is fun. If you haven't tried this game, go do so on Steam or Bing.com. It actually pains me a little to write this because I could be playing the game instead, so don't let my sacrifice be for naught. Go try it. This game has been serious fun for me as well. I have the iPhone version, and have given much of my precious battery capital over to PvZ in the last couple weeks. Thanks for the Warcraft II comparison. I was wondering what felt so familiar and fun about this game, and that's exactly it.